So you want to learn more about trim molding… Boy have you come to the right place! In this article we will cover the different types of materials used. In future articles we will cover how to stain, paint, and install them, as well as cover some of the different styles. Now hold on to your seats, because trim molding has never sounded so good! 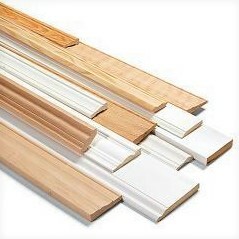 Unfinished Solid Wood Trim – Made from pine or hardwood, wood trim proves the most common type of molding used today. It comes in a multitude of basic styles and as stain-grade or paint-grade molding. Stain-grade molding is the most expensive and comes from clear lumber without knots and other defects, allowing you to achieve an even finish without streaking or blotching. Paint-grade molding is more cost effective and uses short pieces of pine joined together, which makes it unsuitable for stain. It typically comes pre-primed for painting. Unfinished Decorative Wood Trim – This hardwood molding is of a quality to accept staining, clear coating or painting. It also comes in a wide variety of elegant patterns and profiles. Foam Molding – Made from a strong, lightweight foam, this type will not warp or shrink, both issues with wood molding. It easily installs with caulk instead of hammer and nails. No primer is required, and foam molding also comes in a variety of styles. Foam molding can be much easier to install overhead as crown molding. Vinyl Molding – This durable molding uses polystyrene and comes in a selection of different wood grain patterns and finishes, including white. It will not warp or shrink, and it also proves less expensive and easier to install than wood molding. Metal/Aluminum Molding – The look of metal and aluminum molding suits industrial settings and exteriors for the most part, though it could fit into the architectural style of an ultra-modern home. They typically are finished at the factory with a baked-on protective coating, and can be painted. Now that you have a better understanding of the different materials used in trim molding, you might still want help deciding on the style and material. Your professional handyman has the knowledge and experience required to guide you in these important design decisions and will steer you away from decorative moldings and trim that don’t complement the existing architecture of your home or that won’t suit the environment it will be installed in. Your professional handyman also can provide the installation required to make the most of these decorative pieces. Where they go and how neatly they get installed makes all the difference not only in your enjoyment of your home but also the resale value of the property. Utilize our expertise for the best possible results, and GEM will be there with you each step of the way. Summer Ready Lawn Preperation in Anchorage, Alaska. 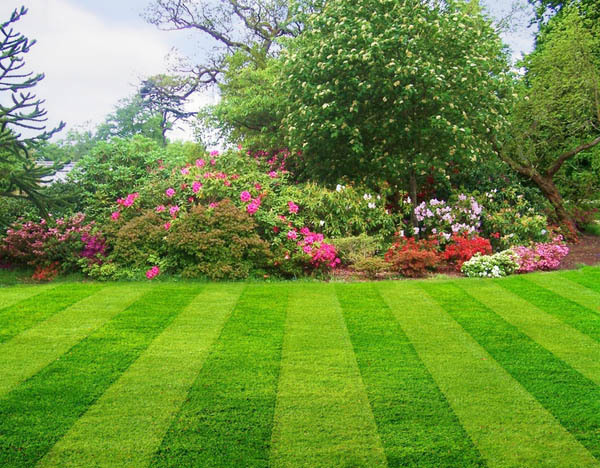 Some tips to help you have the best lawn on the block. Winter is almost over and the mowing season is about to begin! For those of you that are gearing up for the summer, Glaciers Edge Maintenance would like to make sure that you are properly prepared. Below, you will find a simple guideline to preparing and keeping a beautiful healthy lawn. 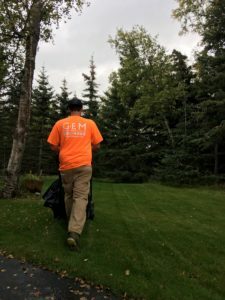 Alaska is considered a cool zone so how we take care of our lawns is important. Alaska’s northern latitude and resulting cool temperatures can retard decomposition time of grass clippings. A layer of thatch can accumulate which can stifle new grass growth and increases susceptibility to disease and winter damage. • It is important to stay off your lawn during break up so it can root and develop turf. During breakup, the lawn is susceptible to rutting and compaction. • Removing gravel is important because it removes the weight from the soil. If you don’t remove it, it will become pressed into the soil and forever change it’s composition. • Dethatching and/or Aerating once snow and ice have melted is also important. • Mow your lawn to a nice even length to help remove any debris such as leaves, sticks, and wild seeds that may have fallen throughout the winter. • Spring is also the best time for performing a Soil Analysis. Doing this will give you more time to correct any deficiencies such as: Improper PH Balance, Low Nitrogen, Phosphorous Potassium etc..
• Apply Lime according to the soil analysis recommendations. If the analysis was not performed, lime can be applied at 10lbs per 1000 sq. ft. annually. • Apply fertilizer according to the soil analysis. If the analysis was not performed, follow the recommendations on the fertilizer.This will help build a thick root structure which will get your lawn looking great.